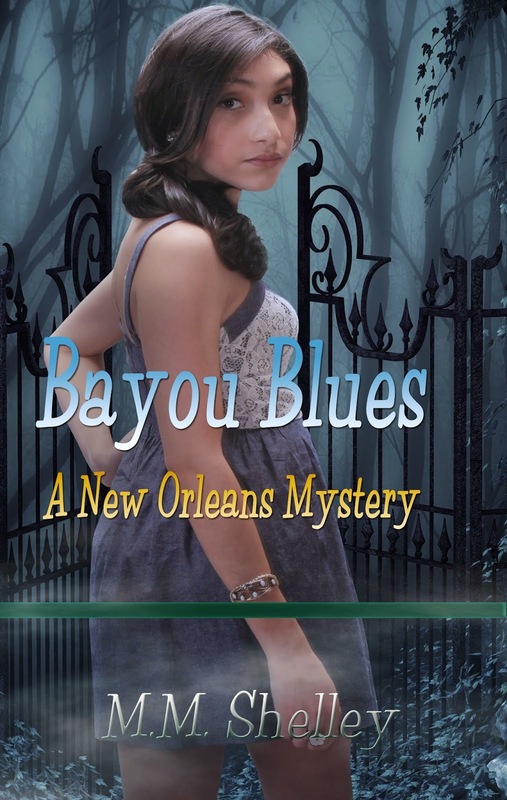 Here is an excerpt of Bayou Blues A New Orleans Mystery, this is an unedited excerpt as I'll be sending this over to my editor soon. It goes without saying that I'm really happy with this story in book #2! I just wanted to share the first moment Ava meets Julian who is of course more than he seems. Sixteen year old Ava Lopez had returned to New Orleans, Louisiana only one month ago and already she was afraid that there was something suspiciously supernatural happening in the French Quarter. She just couldn’t be sure of what it was, but something was snatching people off of the streets. Their bodies were discovered days later in the bayou with strange markings on their arms and legs. Every three days someone from the Quarter went missing and Ava was going to be sure she was there the next time an abduction took place in the Quarter. Ava was the guardian of the city, a burden that had been decided for her. The reasons for it were never made clear to Ava. The fates, who so happened to be three sisters and who lived in New Orleans, had decided that Ava was the guardian they had all been waiting for. Unfortunately for Ava, she had made an enemy of the sisters of fate. She had trapped one of them, Martie, in some sort of parallel universe with no escape and no way for her sisters to rescue her. The sisters of fate were comprised of three sisters and their traditional Greek names were Atropos, Clotho and Lachesis. Together the sisters would decide the fate of every man, woman and child. And when the time came Atropos would cut the yarn that Clotho had spun and Lachesis had carefully measured. Even the sheers they used had a special name. The sisters had called it Atropos. Ava knew the sisters of fate by different names. As the sisters now lived much different lives. Atropos was now Caroline and she was the eldest of the three. Clotho went by Martie, and she was the sister Ava had accidentally trapped in a parallel universe. The third sister was Lachesis who now went by the name of Chantal. Chantal had run an Antique store located in the Quarter. She had tried to warn Ava to stay clear of the shadows that haunted the Quarter. Ava hadn’t listened; she had a good reason for being in the Quarter. She was looking for her friend Dyson who had disappeared and Ava was afraid that his disappearance was linked to the shadows who roamed the Quarter. Ava had saved her friend, but it had come to her at a cost. She would forever have to live with the guilt of trapping Martie and keeping her from her sisters. Ava had left New Orleans, but had to return because she felt a pull. Something wanted her back she could sense it, it called to her everyday until she decided that she had to return. Her dreams had been haunting her with warnings, telling her that something was not right and she needed to return and fix it. The dreams she had while she was living in New York City had been terrifying. Ava had been attending school at Clairemans Academy; it was a prestigious school that had cost her father a fortune in tuition and boarding. Ava’s family was anything but typical. Her father was linked to a Mexican cartel and after his murder at her sixteenth birthday party Ava had tried to prove that he was innocent of the charges the media had placed on him. She was forced to live under the glare of cameras and the media circus that followed her wherever she went. Her face was easily recognizable and she had been labeled as the daughter of a Mexican cartel. It didn’t help that she had her father’s looks; a cleft in her chin, dark brown eyes that were almost black and a prominent widow’s peak. Ava had been dubbed the ‘ice princess’ at school for her ability to hide her true emotions and had grown up being the target of her fellow students whose parents distrusted her father and who did not want their children bringing a mobsters daughter home. As a way to escape all of this Ava focused on her studying and fencing, she also knew several languages. After the death of her father Ava had no family left. Her mother had died a few days after Ava was born on January twenty third leaving an emptiness in Ava as she always felt she was missing an important part of her life and her history. Her father had kept photographs of her mother throughout the house as a constant reminder of the pain of his loss and the love he had shared with her. Ava had inherited her mothers jet black hair and her complexion which was a sun kissed bronze. Ava’s parents were of Hispanic descent and her father had stressed the importance of her ethnicity to her. He wanted her to speak Spanish as fluently as she did English, because of this Ava became fluent in many languages French being her favorite. She grew up with tutors and bodyguards as company; she didn’t mind having them around as they became companions in her otherwise quite life. The bodyguards, Ava knew were necessary. There had been many threats made against Ava’s father while he had been alive. And her father must have known that his time was drawing near as he had begun to make arrangements for Ava’s future without him. A future her father didn’t take into consideration that would include the supernatural. Of her two bodyguards only Oscar was aware of Ava’s abilities. He helped her keep her secret and covered for her on days she missed school. Ava was camped out in the French Quarter, dressed in a pair of black shorts with a high waist and a black tank top. It was fall, but it was still humid. She wore her hair in a ponytail and a pair of simple sandals. Ava was anything but a simple girl as she had a weakness for fashion. But at the moment she was trying to blend in and pretend she was a tourist. She was beginning to learn the turns and twist of the Quarter as she was becoming much more familiar with it. Yet there were times she would find herself lost. Ava removed her compass and flipped it open. The needle of the compass spun round and round before settling in a direction indicating where the danger would be coming from. This was not a regular compass, as it didn’t work as a normal compass should. Instead of giving the direction of where North would be it read where the doors to the paranormal world were located. And where there were doors there were creatures that could come through to cause havoc. Ava made her way through the streets moving pass tourists and locals who were unaware that something dark was about to break through the fragile gates. She could feel the danger pulsing through the compass and into her hand as a warning for her to be on guard. She came to a stop a foot before where she could sense the opening would be and Ava waited. She held the compass clutched securely in her palm. The air around her began to stiffen becoming tight. Ava tried to focus as she tried to drown out the voices from the people strolling by. The air suddenly began to pulse, it shot out toward her nearly forcing her back, and she took a few steps back as the force of it was strong. The veil between the two worlds was suddenly pulled back like a curtain. It peeled back away from her as it began to shift creating a tunnel that grew large enough for someone or something to break free. “What is that?” Someone nearby shouted in disbelief. Ava glanced away in the direction of the voice momentarily distracted. She had nearly forgotten that she was in a busy section of the Quarter. The distraction was all that was needed for Ava to be suddenly hit directly in her chest causing her to stumble back into a tourist who fell down beneath her. The poor man cried in pain as he was slammed against the pavement. “They’ll be coming for you.” A voice calmly said amidst the panic that erupted around her. A black smoke seeped through the air blanketing everything nearby. Ava couldn’t see who had warned her; in fact she couldn’t see anything. She raised her hands up holding them out in front of her as she tried to feel around for her surroundings. She felt a thin strap pull at her neck as she was yanked backwards. Ava tried to fight and break her way free as panic began to fill every part of her. She felt the noose slip free from around her neck and she gasped for air the air that filled her lungs burnt causing her to cough. She was unable to speak and she was still unable to see, but Ava could hear a struggle taking place within a foot of her. Ava’s only thought was that she would have to find a way out of the mess she was in before the fight was over. After all she had no way of knowing if the winner would be a friend or not. Before she could decide on what to do next she felt a tug on her left shoulder. “They’ll be coming for you,” the same voice as before repeated. A golden flash filled her eyes and her sight began to clear of the darkness. Ava found herself in the shadow kings realm. It looked the same as the French Quarter, but it was filled with shadows, shadows who hated her. After Ava had defeated the shadow king the shadows had been bared from the city except for the ones who were strong enough to escape through the locks. “Who are you?” Ava asked. He stood in front of her on guard as he kept his eyes fixed on the unfriendly shadows that were surrounding them. He had dark straight hair. His eyes were green and his skin had a nice warm color to it. His nose was straight but not in a harsh way at all. To Ava, his features looked Native American. “Julian,” he said as he extended his hand out to help her up. He wasn’t very gentle as he yanked Ava up to her feet. “I can get us out of here.” Ava said. She reached for the compass in order to find them a doorway back to the Quarter. “No need for that,” Julian said. He took her shoulder and before she knew it he had them back in the Quarter. They were behind a building that had a sign posted to it reading, ‘Horaito’s Italian Restaurant’ an employee had just stepped outside to empty the trash. He was startled for a second or two before he shook it off with a shrug of his shoulder and proceeded to dump the trash before he headed back inside completely forgetting about the two of them. Julian was headed for the side street exit. Ready to leave Ava and what had just happened behind him. That was until Ava stopped him with her questions. His stance suggested that he’d rather not stay and answer her questions and as he turned the look on his face suggested as much. “How did I get into the Shadow kings realm,” Ava asked. “Are you a shadow person?” Her voice dropped low as she asked the last question. She didn’t want her question to be overheard by anyone. “If I was a shadow person,” he said as he stepped back inside the alleyway. “I wouldn’t have been able to leave the shadow realm. I’d still be stuck in there and I wouldn’t have helped you.” His green eyes pinned her to her stop. His eyes hovered at her before moving to the closed door where the worker had gone through. He seemed concerned that the worker just might return and he didn’t want to be there when or if he did. His green eyes had an eerie alertness about them as they seemed to be reading everything around him almost as if he were weighing possibilities. He must grow tired, Ava thought, of always being on alert. What would have created that constant need to be on guard? Julian’s eyes settled back on her, they were heavy, cloudy and of course alert. “I know all about you, Ava,” he said. The heaviness of his tone spoke volumes. Double Call from Desire Excerpt and Giveaway!